This article was first published in 2009, but has since been updated. Who should speak for your organization in social media? How can you control what’s being said about your group and your cause? If you're not sure, it may be time to work out a social media policy for your staff and volunteers who blog and chat and comment online, where the personal and professional lines often blur. Traditional media relations were almost easy, in retrospect. A reporter called or wrote to request an interview, and you could hook him or her up with a designated spokesperson: your policy coordinator, media relations officer, executive director, or even a trusted volunteer with special expertise in the issue and perhaps some public relations skills. Out-going communications could be readily managed according to an overall strategic plan, when the channels for information flow were formal, slow, and essentially one-way. Nowadays, the world’s most prestigious media outlets, who once would have relied solely on “expert sources” drawn from a pre-approved pool of contacts, are quoting bloggers and tweeters on a daily basis. But that’s just the tip of the iceberg. Social media — social networking sites, blogs, forums, the quick informal exchanges made possible by micro-blogging, livestreaming, text messaging and the rest of Web 2.0’s easy-to-access opportunities for users to generate content — has forever changed the game rules. Realistically, anyone with Internet access is empowered to say pretty much anything (within the loose bounds of international libel law), and more and more people are finding their voice in social media with every day that passes. On one hand, this democratization of speech can represent a golden opportunity for small nonprofits to spread their message — without the need for a massive advertising budget or public relations expertise. On the other hand, nonprofits are fast becoming as concerned as businesses by the creeping loss of control over their “brand” and message. Chris Bailey: The reality is that no organization — either for-profit or non-profit — has control over its image any longer. Any membership association or fundraising nonprofit that thinks otherwise will find out painfully that irrelevance is perhaps the greatest cost of all. Don Peterson: If an org is so worried about liabilities and controversy that they hesitate to join the parade of other orgs that ‘see the light’ regarding Social Media they will simply have to wait and watch until their confidence level arises to the extent that they can take the risk. So what is it, exactly, that worries so many board members and nonprofit managers about participating in social media? Smart organizations recognize that people are going to talk about them in any case, and that the best they can do is try to manage the effect. That’s a tall order, however — simply listening in on the worldwide conversation around your issue can demand a significant time investment — and very few small nonprofits with a limited budget can afford to designate a staff member to handle the job, on top of their regular duties. So the social media strategy of many nonprofits, by necessity, still consists of an ad hoc arrangement where a number of staff people or volunteers will tag-team to cover the major listening posts and respond to comments and questions to the best of their ability. Maggie: One way to minimize the risk associated with “a number of staff people or volunteers” is to limit the number of people with admin rights … to the Facebook page and Twitter account; anyone else on staff who wants to post goes through one of these people. Don Peterson: Common sense ought to prevail here. Of course, anything off topic and not related directly to an org’s mission should stay private…. Beth Dunn: If you haven’t hired people you can trust to behave like responsible adults, then there is a deeper problem. Lorelle VanFossen (Blog Herald ): Do You Need a Social Media Policy? Blue Avocado: What Should We Do About an Employee’s Outrageous Blog? A great many of the people who speak for nonprofits on social media websites, “officially” or otherwise, are very capable indeed — make no mistake about it — but both the individual and the organization are in an inherently risky place without a social media policy to act as a guide for all concerned. How many social media policies have been hastily developed in reaction to an unfortunate blog post or a hasty comment? The Internet never forgets — and by the time a writer has a chance for cool second thoughts, the words have been archived in the labyrinth of search engine indexes and syndicated RSS feeds. Better to be proactive in developing a social media policy, even if you never are called upon to pull it out and quote it. Most people will perform with greater confidence and skill, in an unfamiliar space, when the expectations for their performance are made clear. But what should those guidelines look like? Can you ask your volunteers to adhere to exactly the same social media policy as you require of your staff? How do you draw a line between the public Internet persona and the personal voice? 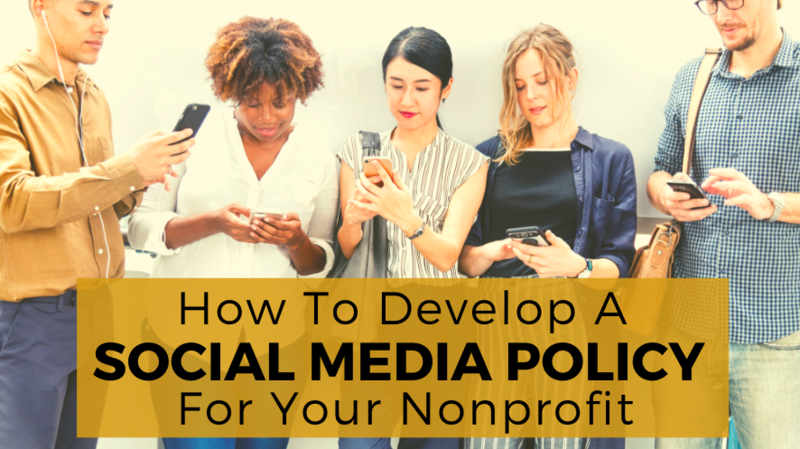 Fortunately, developing a nonprofit social media policy need not be a daunting task, perhaps even more manageable for a small nonprofit with a limited number of staff, and only a few people who will represent the organization online in a official capacity, than for a larger organization. Social networking is, at heart, no more than PR 2.0, and a careful reworking of any existing public relations or media policy should set your organization on a solid basis. Principles for participation online for the UK Civil Service, and comparable (draft) policy documents for Australian and New Zealand government employees. The Blog Council’s Disclosure Best Practices Toolkit. Easter Seals Internet Public Discourse Policy on Beth Kanter’s blog — scroll down the page to read it, and check the comment thread for further links and ideas. Friendly Advice from TechStew — BBYO’s guidelines for staff/volunteer presence on social networking sites. What are your own tips, advice, experience, or other useful resources towards a nonprofit policy for social networking? If your organization has made its social media guidelines available online, please do leave a link in the comments. really comprehensive post! I worked at non-profits for years and the issues are mostly time and responsibility for doing it, which go hand in hand. However, liability was always on the mind of the Executive Director and Board. These will be really helpful for any non-profits looking to institute social media policies. Thanks! I may tweet about this! As a companion plan - what will you do if a crisis hits? Great piece that I just shared on Facebook and a listserv ... appreciate the links and particularly one easy-to-read posting on Have Fun * Do Good which said "If someone writes something bad about your organization [on a comment], I'll betcha that they are saying it to other people, and that other people may have the same feelings. Wouldn't you rather address the complaint out in the open, where everyone can read your response, instead of having talk about you behind your back?" Great reason to take the plunge and hear it all. Eve, thanks for the additional information about Easter Seals' forum guidelines: "Be Respectful" is an especially vital rule, I think -- for any interpersonal communications, but even more important online, when we're communicating in text, without benefit of all the cues we rely on for face-to-face communication: tone of voice, facial expression, etc. Kare, your post is a very thoughtful and thorough addition to this discussion! I found the section "Get Your Facts or the Facts Will Get You" particularly useful in terms of planning a real-time response, so important in online communications. Debra, absolutely agree, the Intel piece is right up there on the list of "essential reading" for its take on the social networking "rules of engagement"! And I appreciate your pinpointing the issues of time, responsibility, and liability as major concerns for nonprofits getting into social media -- would love to learn something of how you and others have addressed these issues! Great summary of the issues Rebecca! Will point nonprofits to it during the webinar I'm doing today on the personal/professional mix and in follow-up blog posts I have planned. Kivi, thank you! I look forward to reading more of your thoughts around this tricky issue. The importance of measuring the effects of your organization’s social media outreach is not in question. But what metrics should you track? How? And what can you do with those numbers? Let’s look at Twitter, for example. I think it's worth adding a point that is perhaps less obvious to people who tune in here. That is, not everyone is on facebook and twitter, and even professional managers and board members may harbor resistance that is a sort of lagging techno-phobia. My director is not on facebook and has no idea what the fuss is about. Most of my board is also not on facebook, and definitely not on twitter. They don't blog, and despite the fact that I bring up at every staff meeting that people need to be writing, it just continues to fall by the wayside. So while it's sort of optimistic to think that there are some rational considerations for not getting into social media, there is quite a bit of the irrational at work here too. Excellent point, Elana. Even if we tend to see it as "irrational" - and in fact, a case can be made for it having a rational basis (see http://en.wikipedia.org/wiki/Technophobia) - the power of technophobia can't be discounted. I suspect that an element of xenophobia (fear of strangers/the unknown) often comes into play here, too. The only way I know of to begin to counter these fears is with small, safe, gradual steps - a program of systematic desensitization, if you will - where success can be assured, demonstrated, and measured. Then you build, very very very gradually, in tiny risk-controlled steps, on each success - being careful to stay within the comfort level of the technophobic person. Anyone else had success with shifting the position of the technophobes in your life? I'd love to hear how you tackled it!